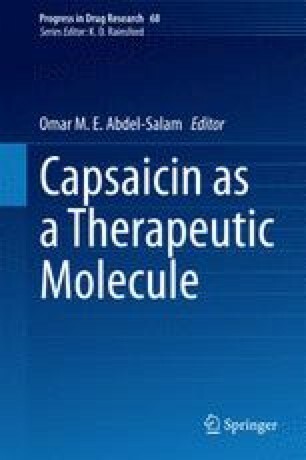 The capsaicin receptor, transient receptor potential vanilloid type 1 ion channel (TRPV1), has been identified as a polymodal transducer molecule on a sub-set of primary sensory neurons which responds to various stimuli including noxious heat (>~42 °C), protons and vanilloids such as capsaicin, the hot ingredient of chilli peppers. Subsequently, TRPV1 has been found indispensable for the development of burning pain and reflex hyperactivity associated with inflammation of peripheral tissues and viscera, respectively. Therefore, TRPV1 is regarded as a major target for the development of novel agents for the control of pain and visceral hyperreflexia in inflammatory conditions. Initial efforts to introduce agents acting on TRPV1 into clinics have been hampered by unexpected side-effects due to wider than expected expression in various tissues, as well as by the complex pharmacology, of TRPV1. However, it is believed that better understanding of the pharmacological properties of TRPV1 and specific targeting of tissues may eventually lead to the development of clinically useful agents. In order to assist better understanding of TRPV1 pharmacology, here we are giving a comprehensive account on the activation and inactivation mechanisms and the structure–function relationship of TRPV1.